As you enter the lush lobby of the Taj Mahal Hotel in Colaba, Mumbai, turn left. Behind the long, gleaming reception desk there is an equally long, vivid-in-its-redness triptych. It’s a Husain. Stand a while; take it in. Now stroll down the corridor to the left. Peep in at the Harbour Bar (incidentally, the oldest licensed bar in the city). Anchored there are a Ram Kumar, a Laxman Pai and a Rajesh Pullarwar. Now, down the corridor. Take a left into the stairwell of the hotel’s heritage wing. 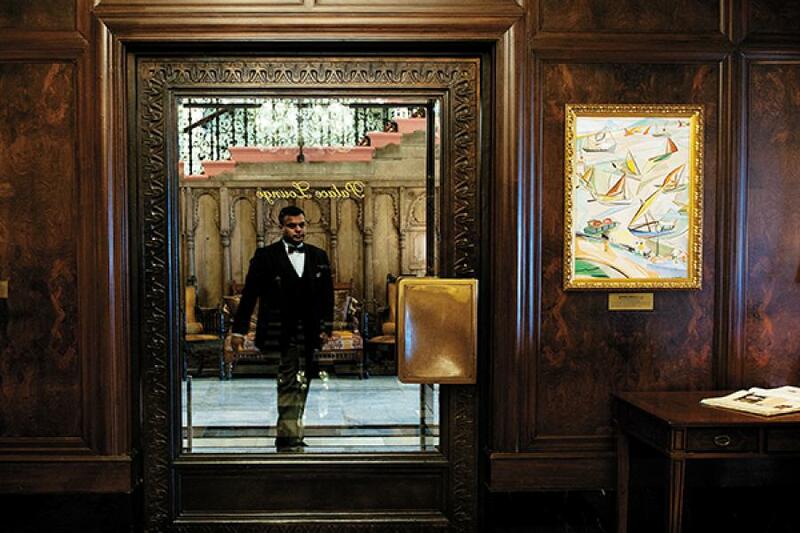 Before you take the stairs, step into the Palace Lounge. Amid the hushed silence of its plush interiors, resting on its sombre wooden walls, are a couple of VS Gaitondes, a Ram Kumar, and a Jehangir Sabavala. Tear yourself away; take the grand staircase. As you ascend, your feet sinking into the carpet, you come face to face with an SH Raza. On the first floor, step into the banquet hall. Take a slow, deep breath. Around you are works by KK Hebbar, Anjolie Ela Menon, Vivan Sundaram, Sabavala, GR Santosh, B Vithal and Laxman Shrestha. And this is a mere sampling. The Taj’s collection of paintings by modern Indian artists is one of the largest in the country—about 1,000 original paintings, including about 200 masterpieces, and another 3,000 prints—and rivals some of the best private treasure troves of the country’s most zealous collectors. And what sets it apart is the fact that instead of being guarded by jealous owners behind high levels of security or in secretive private galleries, it is out there for anyone who walks in to admire. Well, at least some of it. The Taj, as we see it today, was not always so. Neither was the now-famed art collection. From the time it opened to the public—on December 16, 1903—right up to the decade after India’s independence, the history of the Taj is generously populated with royal (and loyal) guests, grand parties, extravagant entertainment, and national luminaries. But once the Second World War was over and the country independent, the arduous task of nation-building lay ahead, and the going was not all that smooth. “The Taj too, was having its post war problems, albeit of a different kind and on a different scale. The turnover during the last year of the War had been the highest ever, with bar receipts alone amounting to two million rupees. However, increasingly large sums of money were now having to be spent on keeping the Taj and Greens in running order,” write Charles Allen and Sharada Dwivedi in their book The Taj at Apollo Bunder. And change it she did, over the next 35 years, during which she was associated with the Taj Hotels Resorts and Palaces (she retired as head of housekeeping in 1997). 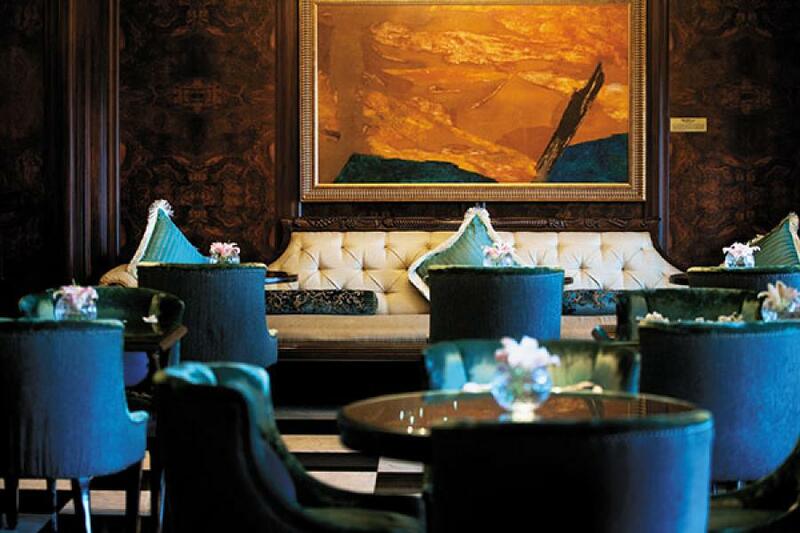 Along with Rodabeh Sawhny’s (JRD Tata’s sister), Kerkar’s efforts at the Taj Mahal Hotel included a severe overhaul of the hotel’s interiors, bringing in paintings, antique furniture for the lobby and the corridors, replacing old metal pillars, and changing existing colour schemes. 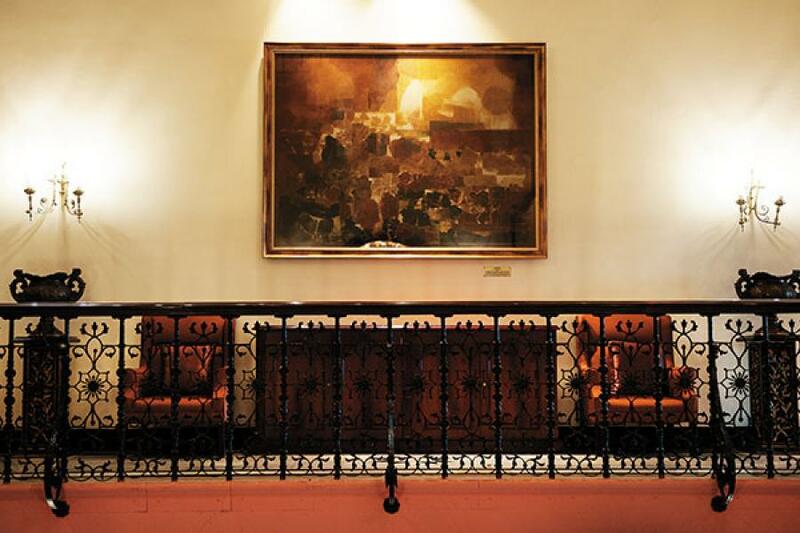 It was during the first decade or so of Kerkar’s association with the hotel that the art collection was born, driven by the need to extensively redecorate the interiors. The TAG, situated where the Palace Lounge now sits, was a notch above the other two galleries—Pundole and Chemould—in the city in the ’60s. Kerkar remembers making the gallery “nice and air-conditioned” but the hotel discontinued it. “It did not want a gallery that did not make any money,” she says. The collection, today, is one that is “priceless”, says Mortimer Chatterjee, of the Chatterjee & Lal gallery in Colaba, and also, since 2006, consultant to the Taj Mahal Hotel’s art collection. Chatterjee talks about how the collection has come to represent a snapshot of the years in which the paintings were collected. He believes it is a reflection of the optimism of nation-building that existed in the 1950s and ’60s. This attitude looked at contemporary India and all that was good in it, instead of looking back into the past. Through the collection you also get to see the evolution in the styles of paintings of different artists: From a time when they were influenced by the European styles to finally evolving and developing their distinctive, confident styles and coming into their own. Chatterjee believes that during the acquisition phase, abstracts were probably preferred, as they are more neutral in their themes, and do not usually portray sombre or disturbing emotions. Pundole, however, believes that these distinctions are more a product of present times: When the paintings were bought, he says, “Nobody thought like this. They just bought the paintings they liked.” Case in point: The Tyeb Mehta that hangs in the sixth floor of the heritage wing. From the painter’s ‘diagonal’ series depicting the country’s Partition, the painting is dark and disturbing, and shows an anguished human figure. This relationship is evident, for instance, in the works of Laxman Shrestha. Chatterjee says, “We have a collaborative work between him and Ratan Tata. There are several other works of his in the property, and he talks of a long-standing relationship between him and the hotel. I have taken Raza around the property and shown him his own works and those of his peer group. When he saw one of his own works, he made a simple namaste gesture, almost in the manner of a greeting. But in front of the Gaitondes, he just stood for minutes upon minutes in silent reflection. And you could see he was visibly moved by the experience.” He adds that because of the warm ties, it is sometimes difficult to figure out if a particular painting had been bought or whether an artist had given it to the hotel. Although the bulk of the hotel’s collection had been built by the 1980s, it still commissions works. 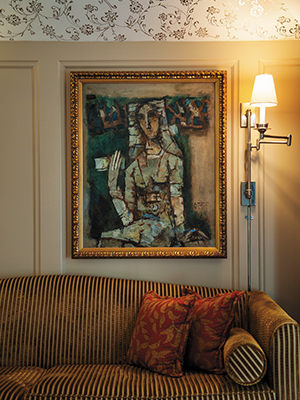 The Husain triptych behind the reception—unveiled in December 2000 by Ratan Tata—was one. Rajesh Pullarwar’s depiction of Mumbai—spanning the entire width of the rearmost wall of the Harbour Bar—would be another. An art walk was also initiated in 2013 for citizens and art lovers. The 45-minute walk took visitors from the lobby, to the Harbour Bar, the banquet hall and the Palace Lounge of the heritage wing. Although this is no longer open to the casual passerby, art walks are arranged on request for residents and loyal patrons of the hotel. Like other hotels that house art, the Taj, too, has trained its housekeeping staff to check for signs of dust, fungus, moisture and other damage. Maintenance and restoration work takes a couple of hours per painting, and is done when the need arises. Restoration work was, however, required on an unprecedented level after the terror attacks of November 2008. Priya Khanna, who, along with her team, worked on the damaged artworks for several months, says, “It was like 10 years worth of damage took place within a span of four days. There was extensive damage by soot and water, there were tears in the canvasses, there were bullet holes. Some paintings were permanently damaged. 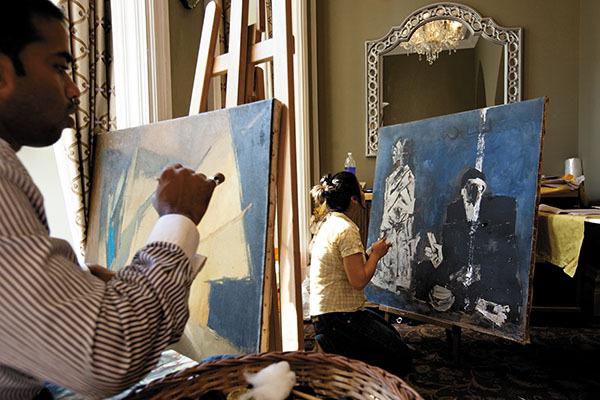 Nothing could be done to recover them.” Khanna and her team worked in a cordoned-off part of the hotel’s ground floor, slowly restoring the paintings to their original form.